If you work for an employer that automatically withholds taxes from each paycheck, then you can adjust how much is withheld by changing your election on IRS Form W-4. It can mean the difference between getting a big refund at the end of the year or receiving a big tax bill. Most people fill out the W-4 form when they first start a job. It asks you to add a "1" for each allowance (allowances accrue for you, for your spouse, for children, and for other factors such as filing status). The total number of allowances you claim determines how much income tax is withheld from your paycheck. Claiming more allowances tends to mean you expect a lower income tax bill, and that means less tax is withheld. It's possible you didn't pay that much attention to your election choice at the time you first filled out the form — many people don't. But despite this, it's important to review your elections, especially if you've had any changes in your life. Events like marriage, childbirth or even moving to a different state can affect which W-4 election suits you best and whether you end the year in a good place, tax-wise. Here's a guide to making this election. All of these events can play an important role in your tax situation. Some may require that you pay more taxes, while others may entitle you to additional tax breaks that require fewer taxes to be paid. Did you receive a sizeable tax refund last year? Then you are withholding too much. Were you surprised to find out that you owed the IRS money? You didn’t withhold enough, and you may even owe a penalty. As you probably suspect, your goal should be to strike a balance so that you receive little or no refund. If you’re withholding more than necessary, you’re taking money out of your pocket each paycheck and giving the IRS a free loan with your money. The W-4 form has instructions and a worksheet that can walk you through the exemptions, but that can be a bit intimidating. Fortunately, the IRS has a useful tool that can help you estimate what you should claim on your W-4 so that you don’t have to guess: IRS Withholding Calculator. This online tool can simplify this process for you. 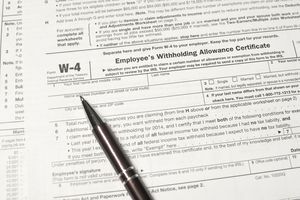 The W-4 will take care of your federal tax withholding, but you should check with your employer to see if any changes need to be made to your state withholding as well. Every state is a bit different, but the form should have basic instructions that can help you select the right withholding without much trouble.